My sewing classes have grown to 16 students for September. Since the classes are getting bigger, I do not have as much time to spend with each student. I need a sample book of various sewing techniques using a variety of fabrics. Maybe that way maybe I can explain things more quickly. JoAnn’s has 50% off all red tag fabrics this weekend, so I bought a few tricky to sew fabric samples. 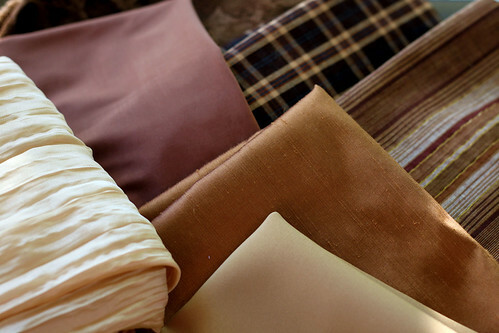 I found a variety of fabrics in browns to keep with some kind of a color theme. Most of the fabrics were only 75 cents for 3/8 of a yarn. I was able to get samples of swimsuit lycra, silk, velvet, vinyl, taffeta, stripe, check, polyester, crinkle pleat, and a metallic. Most of the basic samples will be in muslin. I ordered a sewing course book to help me remember all the different samples I made in college. This should be fun after sewing for so many years. I am sure there is much that I have forgotten. This entry was posted on Saturday, September 5th, 2009 at 3:00 am and is filed under Sewing. Tagged: Fabric, Sewing. You can feed this entry. You can leave a response, or trackback from your own site.